Sponsored by First Society, Chicago. 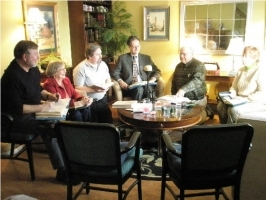 This group studies The Urantia Book with an emphasis on stimulating discussion. This group follows a "Paper Topical" format, combining thorough interpretation with reading of selected passages on a theme or topic. E-mail with postal address to be placed on our mailing list and receive meeting schedule with complete details, including topics to be studied..Newcomers are always welcome.